David Tibet Announces New Release and Live Performance With Nodding God – Zero Equals Two! “NODDING GOD were formed 666 years ago by Andrew Liles, David Tibet, and The UnderAge Shaitan-Boy in a Boys-Only preparatory boarding school in Babylon, since shut down by unfortunate events that took place there, in the night, in the dark. “Their first album, WOODEN CHILD, is released on House Of Mythology in May 2019. Sung 93% in Akkadian by David, who has studied this language for many years, this New Baby God Who Nods—a Nodding God, a Godding Nod—WOODEN CHILD is powered by Stars and Cuneiform and Pop and Drop and One Thousand Liles In One Thousand Axes. 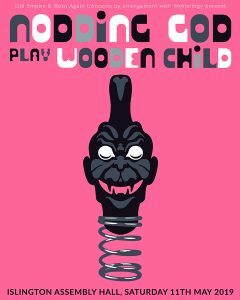 “Nodding God’s Virgin Boards Appearance will be at the Islington Assembly Hall on Saturday May 11, where they will PLAY WOODEN CHILD in its entirety; the event is presented by Old Empire & Born Again Concerts, in association with Mythology. “Joining Andrew and David on the boards will be Reinier van Houdt and Michael J. York on Analogue Synthesisers and Drone Planks and Organ Lords, with FluorescentFilms by Davide Pepe and Lasers by Rob of StanWaxLasers. The UnderAge Shaitan-Boy is, unfortunately, under Police Curfew and will be unable to attend this time, despite legal representations to the authorities to allow him to appear. “Tickets are now available. Special Guest Is Secret but might be announced soon, or might not be.